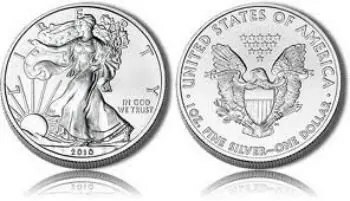 The American Eagle Silver coin is the official silver bullion coin of the United States as authorized by Congress through the Liberty Coin Act which became public law on July 9, 1985. 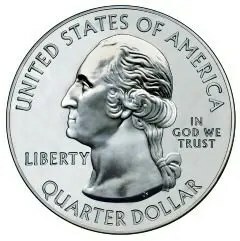 The United States Mint first released the coin on November 24, 1986. 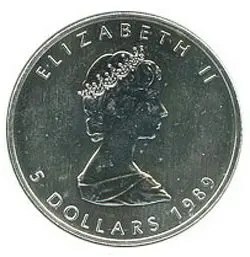 From 1986-1992 proof Eagles where minted at the San Francisco Mint and have the S mint mark, from 1993 through 2000 proof Eagles where minted at the Philadelphia Mint and have the P mint mark, Since 2001 proof Eagle have been minted at the West Point Mint and display the W mint mark. 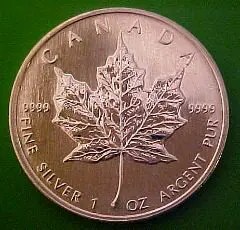 The Canadian Silver Maple Leaf bullion coin has been minted by the Royal Canadian Mint annually since 1988. 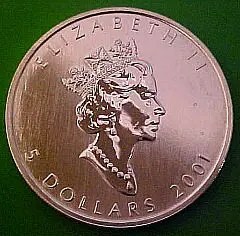 The coin has the highest face value $5 and purity .9999 of all official government silver bullion coins. 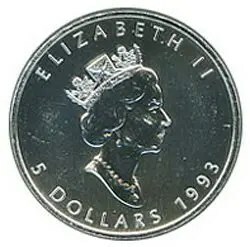 There are three different versions of Queen Elizabeth on the observe of the Silver Maple Leaf. The design on the left, below, was from 1988-1989, the design in the middle was from 1990-2 and the 2004-present design is to the right. In 2006 the mint issued a half ounce Silver Timber Wolf which was an outstanding success. Previous Batten Down the Hatches: A Hurricane of Debt, Deficit and Demographics is Coming! Next Any Way You Look At It the S&P 500 is Overvalued In Excess of 40%!